Last call to buy tickets for the 4th annual Nite at the Net! Don't miss your chance to meet and mingle with NBC5 personalities and the Chicago Blackhawks, 7 p.m. until 1 a.m. Saturday, March 21 at the Hinsdale Racquet Club (5730 S. Grant St., Hinsdale; 630-325-6066). Proceeds from the event benefit A Silver Lining Foundation and the Foundation Fighting Blindness. Enjoy food, beer, martinis and wine, while bidding on silent auction items under a heated tent. Hang out with Blackhawks defenseman Brent Sopel, and play air hockey and table tennis while a DJ spins tunes. Scotch and cigar lovers can take advantage of the private area allotted to them, and for tennis fans, the Hinsdale Racquet Club will have open courts available for nonstop tennis. The club's pros will even be there for swing advice and other tips. 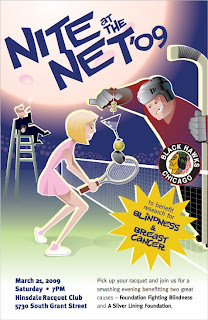 Tickets to the event are $100, and can be purchased at http://www.asilverliningfoundation.org/; http://www.niteatthenet.org/ or by calling the Hinsdale Racquet Club.